How do I find my polling place? 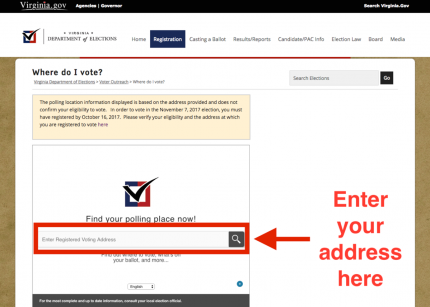 To find your polling place, visit the Virginia Department of Elections website at http://www.elections.virginia.gov. The image on the right shows you where you will enter your address. After you enter your address, the Department of Elections will then generate your polling place’s location.